EAA’s AirVenture 2018 is closed out and packed away. Some final numbers are listed in the sidebar, but it would be interesting to know how many actual steps were taken by visitors during the event. Chapter 932 was represented by all of our officers as well as a good number of members and their families. 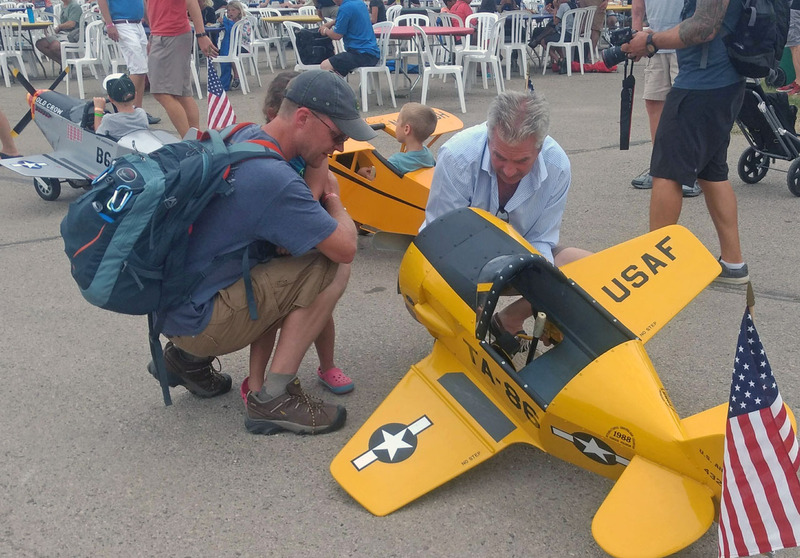 People attend AirVenture for many reasons, the most obvious being the airplanes: frenetic arrivals, warbirds, ultralights, vintage and aerobatic, seaplanes and balloons…flying machines to nourish everyone’s interests. Some come to attend the many Forum offerings or learn new skills at Workshops that offer welding, fabric covering, wood and metal construction, etc. The recent development of unmanned aerial vehicles (UAVs) compelled the opening of new areas where you can witness and learn about the latest in aviation innovation. Many visitors come long distances to look and shop for the latest avionics and other components for planes they’re building back home. Concerts, movies and talks from aviation celebrities round out evenings at AirVenture. Last, but not least, are the daytime and evening airshows. In a word, spectacular! achievements. Our very own Meira Leonard was one of them, receiving the Chapter Web Editor’s Award for the creation of our outstanding EAA932.org web site. Just two years ago, Meira earned her PPL at Galt. A move to Hawaii followed, where she continues to run Lionheart, her website design business. During her flight lessons, she developed several memory aids and began to post them on what has become her flight training oriented website, BlondesInAviation.com. Meira now serves on the board of the General Aviation Council of Hawaii. She also manages to get stick time as a flying member of AuxAir, a volunteer aviation group similar to CAP but an adjunct of the Coast Guard, and helps with offshore search and rescue and marine wildlife protection. She is also working on her instrument rating. Whatever the challenge, she’s up to it! Fortunately, some last-minute planning enabled Meira to attend the awards breakfast, along with several chapter members as seen in the accompanying photos. Thank you Meira, for everything you do for EAA Chapter 932. You make us proud! Consider sharing information about an event you attended, someone you met, a place you visited, a helpful maintenance tip, a really good photo or even a link to an interesting article you read. We always welcome your contributions and ideas! Everyone has a story to tell, and we look forward to reading yours! Email the Web Editor at editor@eaa932.org. Articles submitted may be edited for content. Now that the dust has settled from AirVenture in Oshkosh, it’s time to look forward to more fun chapter activities. Flight Deck Bar and Grill, and to watch the skydivers from Chicago Skydiving Center. We’ll meet at Galt at 10 AM for some short announcements and then mount up. If we run short on seats, Rochelle is close enough that we can dispatch a couple of vehicles too. If you’re renting a plane, we should be back by 2:30 PM. Planes will probably fill up fast, so book now! Passengers: Don’t forget it is legal and welcome for you to help share expenses with your pilot. 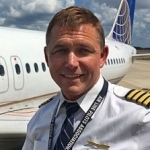 To help everyone plan, our chapter secretary, Paul Sedlaek, has created a short online form to allow us to match up pilots with passengers. Please respond by Monday, August 6th if you’re interested in participating. Click here to link to the sign-up form now! 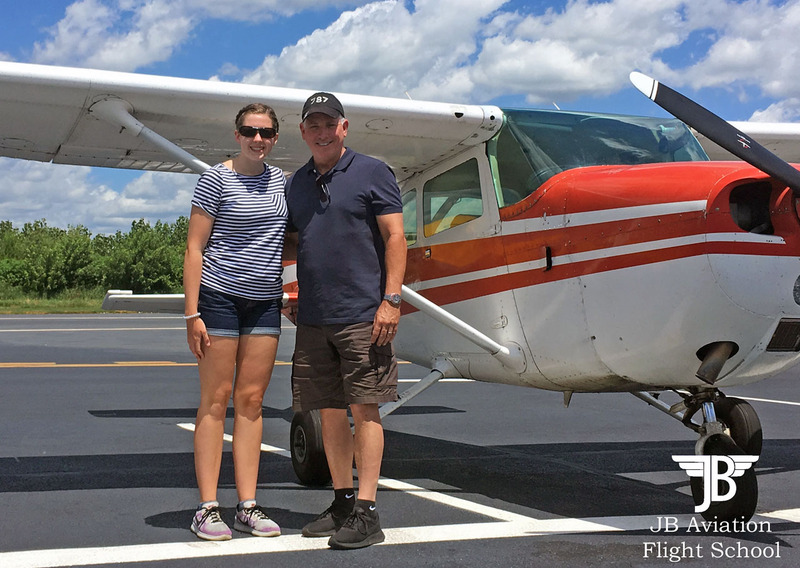 Congratulations to Gretchen Thennes who earned her Private Pilot certificate on 7/17/2018! Gretchen is pictured here with DPE, Dave Monroe. 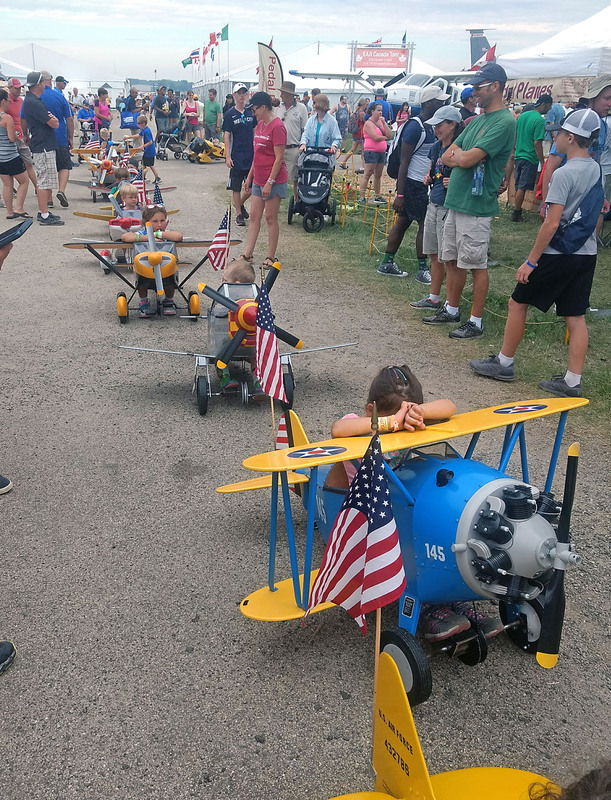 Though the traffic pattern may have been a bit chaotic, and a T-6 suffered a serious gear collapse, even the fly-over by the Blue Angels had a hard time topping the mass arrival of pedal-planes to Boeing Plaza. An unnamed A&P-P mechanic stepped in to quickly perform the needed repairs on the T-6’s wheels while the pilot was comforted by her dad. The Lindbergh Innovation Forum featured nine presenters from across the high-tech world and was possibly the most interesting event I have ever attended at Oshkosh. Lots of cross-pollination of ideas between industries working on the near future. I don’t know how to reconcile Boeing’s statement that 800,000 pilots will be needed in the next 20 years with the research being done on autonomous vehicles, but either way, tomorrow is going to be fascinating. • 05,000 volunteers helped keep things moving. • Over 10,000 aircraft arrived at OSH or other nearby airports. 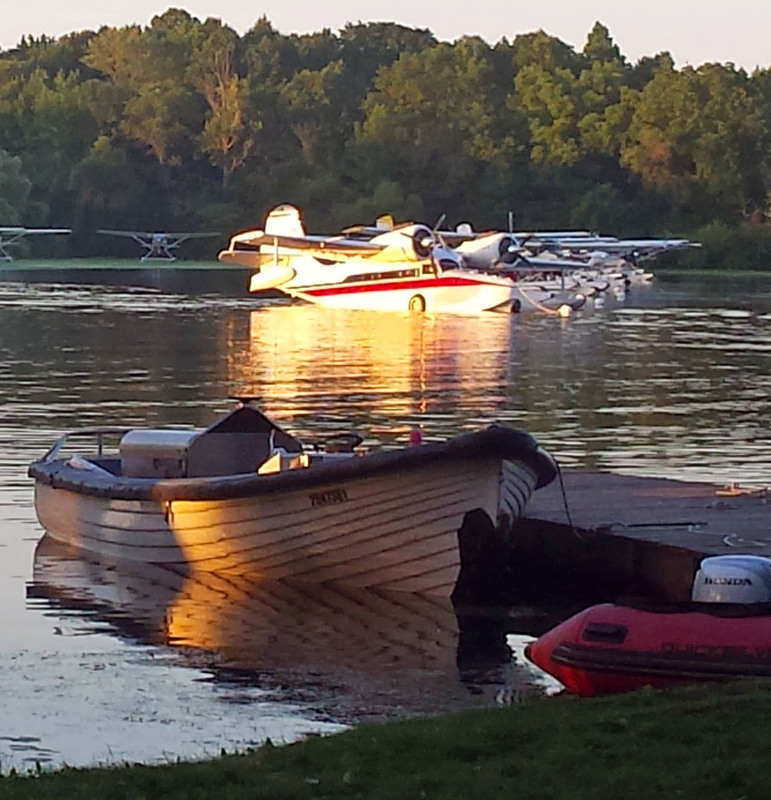 • There were 1,160 homebuilt aircraft, 1,094 vintage airplanes, 377 warbirds, 185 ultralights and LSAs, 75 seaplanes, 52 aerobatic aircraft, 22 rotorcraft, and 14 hot air balloons. • There were 19,588 aircraft operations in an 11-day period averaging 134 takeoffs/landings per hour. • A total of 1,500 forums, workshops and presentations took place, attended by more than 75,000 people. • EAA photographers uploaded 2,400 photos that were viewed more than 12.4 million times. • EAA streams were accessed 800,000 times by viewers in over 200 countries. 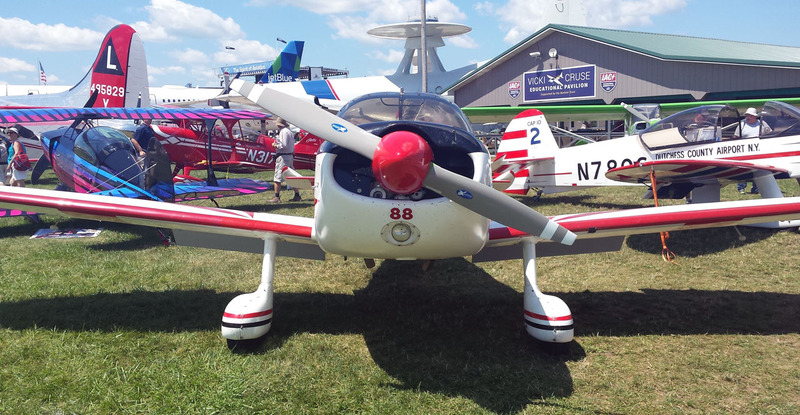 • AirVenture brought an estimated $170 million into the Oshkosh regional economy. Day 1 at Camp Scholler Men’s showers: bring soap. Day 2: at least 2 perfectly useable bars of Irish Spring will be in any shower stall you pick. Big money could be made any morning by a coffee cart placed just outside the shower building. There are way too many motorized vehicles in Camp Scholler. Wittman Field may be the busiest airport in the world during AirVenture, but the greatest risk is trying to get to the new entrance gate at the Fly Market by crossing the campground intersection of Schaick Rd. and Forest Home Ave.
An early breakfast at the Vintage Café while perusing the morning edition of EAA Today and planning the rest of the day is one of life’s little pleasures. You can get a useable wi-fi signal just about anywhere on the AirVenture grounds…except inside the Innovation Center. Never buy a hi-capacity portable battery from a no-name vendor. Ask me why I know this. The AirVenture phone app lists no fewer than 15 locations where flush toilets are available. Just sayin’. Apparently, not all ideas that emanate from the mothership strike a positive chord among the members. Only two chapters took the time to build Adirondack chairs. Ours, of course, were the best, thanks to Bill Tobin. No matter HOW comfortable they feel, NEVER wear the same pair of shoes two days in a row. Chapter 932’s very own campsite! I hope everyone is doing well as we are in the midst of summer here in Northern Illinois. As usual, summer will be gone before we know it! 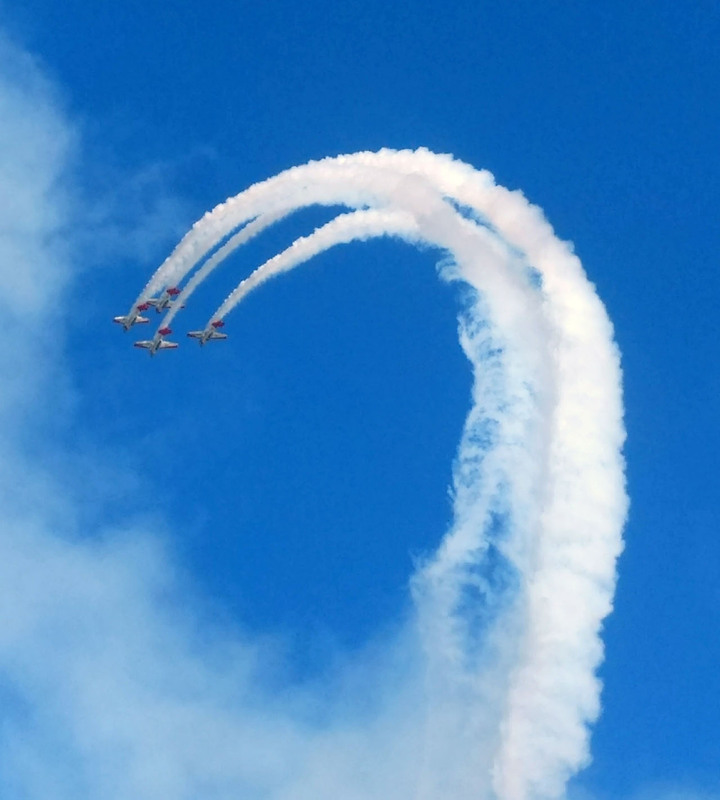 As I write this, I am looking back upon the great week that many of us enjoyed at Airventure in Oshkosh, Wisconsin. The weather cooperated nicely, and as always there was no shortage of great things to see and do. One of my favorite things about Oshkosh is connecting with people from all backgrounds of aviation. It makes one appreciate the true passion and enthusiasm that we all share in our awesome community of aviation. As a chapter, we tried something new this year at Airventure. A few folks in our chapter procured campsites clustered together through EAA’s chapter camping program. 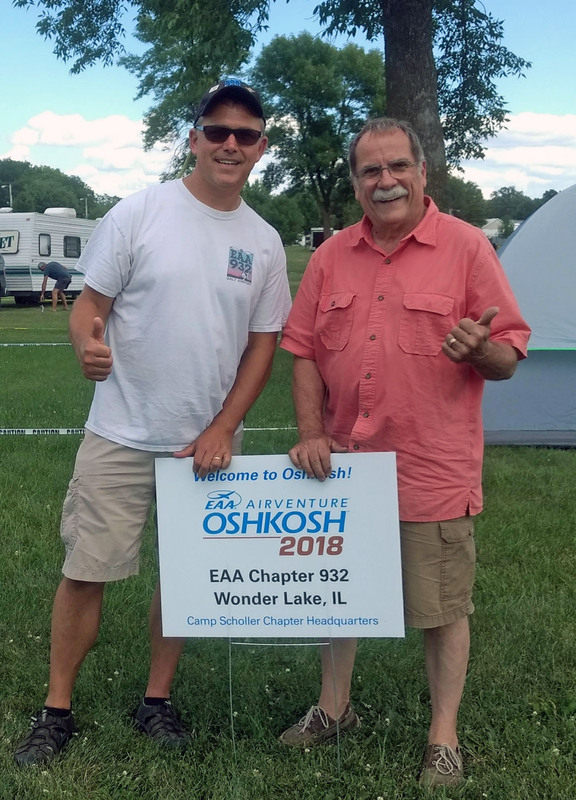 The sites we had were pre-plotted by EAA staff before the start of Airventure in a very desirable location at EAA’s Camp Scholler. We tried this as an experiment to see what kind of interest we would have from our membership. For those who partook in chapter camping, I think we have a solid interest for doing this again next year. A fun time was had by all who camped on our sites. The fellowship among our members was very enjoyable. 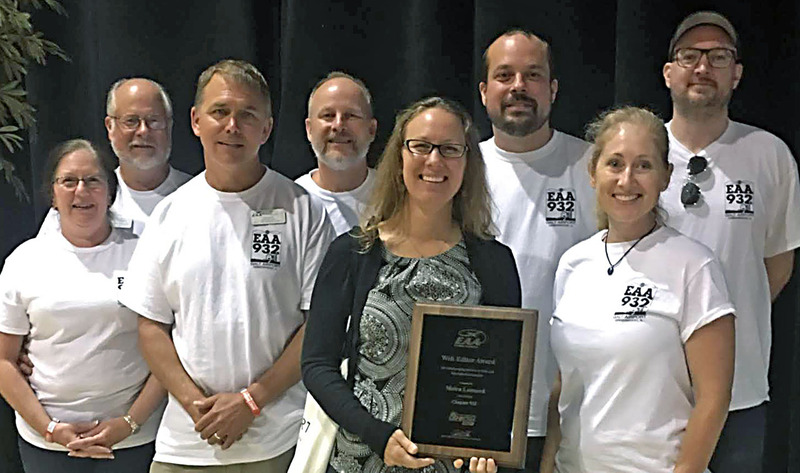 EAA Chapter 932 received some excellent recognition during Airventure this year. I think you have heard me talk about our chapter website many times over the past few months. Our web editor, Meira Leonard received EAA’s Web Editor Award for 2018 at the annual Chapter Leader Breakfast in the Founder’s Wing at the EAA Museum. Many of us have worked hard to build up our chapter website under Meira’s leadership. The website is a tool that helps us communicate happenings within our chapter, and also attract membership. Receiving this award was a high honor for all of us! Meira flew in from Honolulu to spend the week with us on our campsite, and receive the award. I would like to thank Jerry Thomas for providing his camper as the “hospitality suite” for Meira as she joined our chapter in celebrating the award! 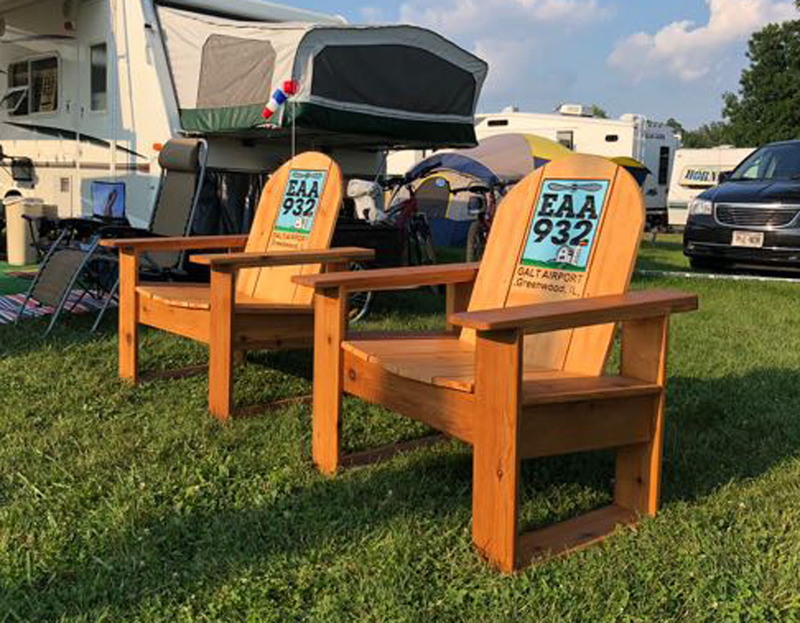 Another accolade that we received from EAA leadership was for the Adirondack chairs that we built for the Blue Barn Chapter Pavilion located on the grounds of Oshkosh. Bill Tobin lead this project for us. Bill along with a few chapter members constructed these chairs over the past few weeks at Galt Airport. The chairs displayed beautifully, and will be a monument of our chapter for many years to come at the Blue Barn. Thank you Bill and all of those who helped on the Adirondack chair project! Our monthly chapter gathering will be on August 11th. Our plan is to fly out to Rochelle Airport located south of Rockford to have lunch and watch all of the cool action that goes on at the Skydive Chicago Center located on the field. The Flight Deck Grill Restaurant located adjacent to the Sky Diving Center offers excellent food, and their patio is a great place to sit and watch the sky diving. Prior to the gathering we will need a count of the number of pilots willing to fly, and the availability of extra seats in their aircraft. Please look for an email with more information about this gathering. If the weather does not cooperate, we will do our best to have lunch at a location on or around Galt. 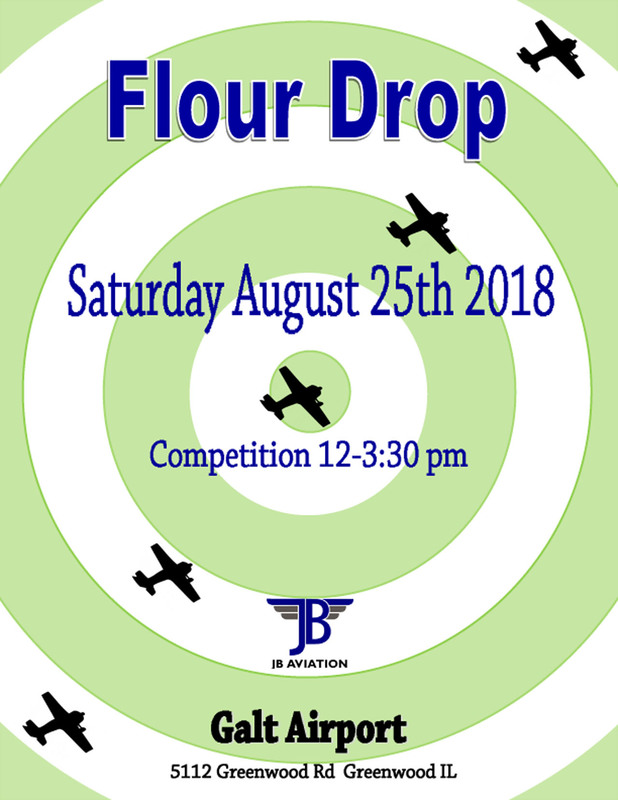 Once again JB Aviation at Galt Airport will host their annual Flour Drop. This will take place on Saturday August 25th from 12:00 noon to 3:30pm. Although this is not an EAA event, we encourage all of our chapter members to attend and enjoy the great fun that we have at the flour drop. I am saddened to report that one of our long standing EAA 932 Board members is stepping down from her position on our chapter board. I think that we all know Beth Rehm very well. Beth is mourning the recent passing of her mother in England, and has decided to step down while she takes care of herself and her family. Over the years Beth has been a tremendous asset to our chapter and to the EAA. She has worked tirelessly over the years to contribute to our chapter, and to EAA in Oshkosh. 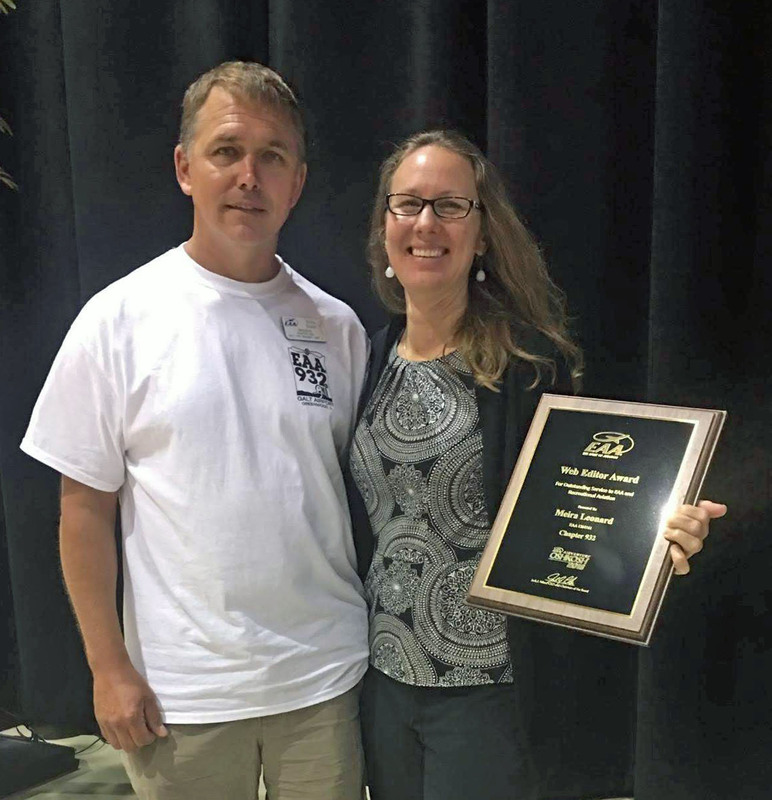 Some of her most outstanding achievements include winning the EAA Chapter Newsletter Award in 2012, and standing up the scholarship fund that we have at EAA 932. Beth has also been the organizer of many great chapter events over the years. Her leadership, keen sense of organization, and very practical way of providing input to our chapter leadership will be very missed. I look forward to still seeing Beth around the airport, and as a member at large of our chapter. As we move into August, I hope that everyone continues to enjoy the warm weather flying months, and everything that goes on at Galt Airport. Thanks to all who make our chapter and our Galt Airport Community one of the best in the world!